Your adventure truck is no strangers to the occasional mud bath out on the trail. While you don’t mind getting drenched in filth during an epic trek across an uncharted trail, you cannot abide a poorly-fitting accessory anywhere on your truck—especially auxiliary lights. 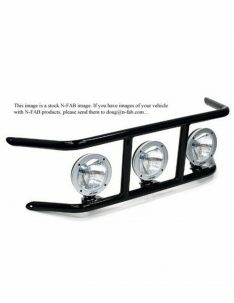 For the ultimate in lighting integration, upgrade your truck with a bumper light bar mount kit. Back in the old days, upgrading your front-end illumination meant throwing off your factory lines with bulky light bars, gargantuan grille guards or exposed brackets. 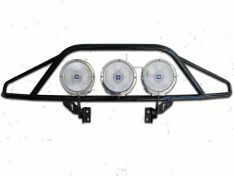 But Crossed Industries Bumper Bar’s For Lights are custom designed to house your light bar, or auxiliary lights directly behind the opening of your bumper for a flush, factory-installed fit and finish or right up front and center to show off what you got. It blends in so well you might forget you’re even packing all that extra candlepower—until you flip a switch and drench the path ahead with blinding light. 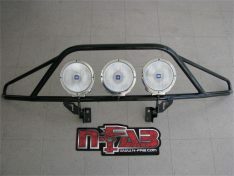 These products are all custom designed to fit your trucks year make and model by N-Fab.